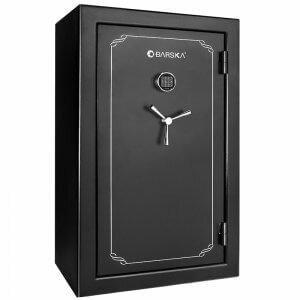 If you are looking for the ultimate protection for your firearms, jewelry, or important documents, look no further than the Barska line of Fire Vaults. These durable vaults have been designed to resist fire damage and protect the contents from theft with solid steel locking bolts. 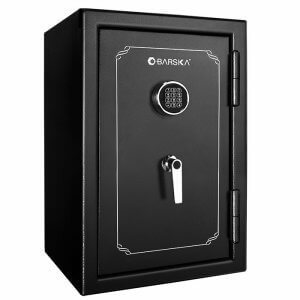 Barska carries a large variety of fire vaults for a wide range of storage needs, including jewelry, rifle, and all-purpose safes that offer excellent fireproof and theft protection for your valuables. With many options of fire vaults available from Barska, it is important to review each product to find the right safe for you. If you are looking to store jewelry and other small valuables, the White Digital Keypad Jewelry Safe would be the best option for you. 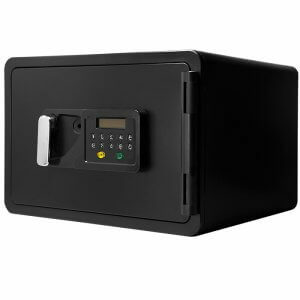 For storing important documents, money, electronics, and other miscellaneous valuables, the FV-500 Fire Vault (AX12674) or the Fireproof Digital Keypad Safe (AX11902) will satisfy your storage needs. If you have a large rifle collection that you would like to keep safe from an unexpected fire or theft, the FV Series of Fireproof Rifle Vaults will be an ideal secure storage solution. 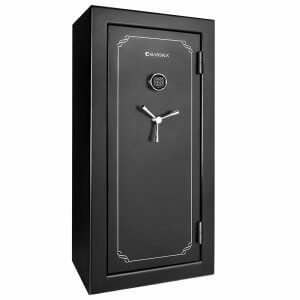 The FV Series of Fire Vault Safes from Barska have been specifically designed to provide excellent long-term protection for your firearms, ammunition, and other valuables. The all-steel exterior construction houses fire retardant gypsum board to provide fireproof protection to the contents inside. Multi-point steel deadbolts provide maximum security from theft, and ensure that only the authorized users with the correct PIN can gain access to the safe. 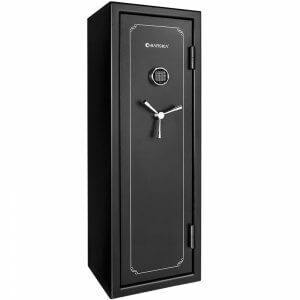 Each Fire Vault model features a digital keypad and two traditional back-up keys, and has been certified by the California Department of Justice as an approved rifle safe. To find out which FV Series Fire Vault best fits your needs, refer to the list below to see the rifle storage capacity for each model. 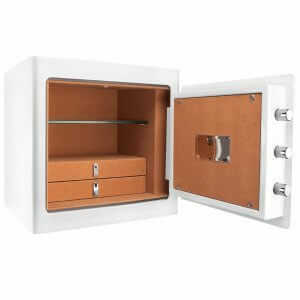 Secure your jewelry in style with the White Digital Keypad Jewelry Fire Safe from Barska. Open this fireproof jewelry vault to reveal a series of wooden drawers with assorted jewelry trays and hooks. A motion-sensor LED light automatically turns on whenever the safe is opened, providing the user with bright illumination. 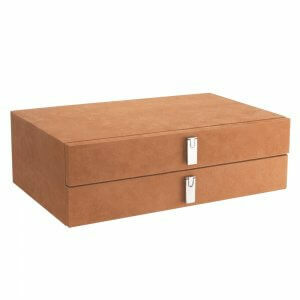 A series of padded drawers and hangers provide protective storage for bracelets, necklaces, rings, and earrings. The Barska Fireproof Digital Keypad Safe (AX11902) is an excellent way to provide longterm fireproof protection for important valuables. 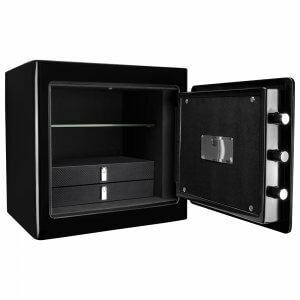 The spacious interior of this fireproof safe can house multiple items, such as money, jewelry, compact electronics, and important documents. This fireproof safe is accessible using a digital keypad that can retain up to two PIN codes, which eliminates the need for making additional key copies. This Digital Fire Safe also includes two traditional keys for access without the PIN code. 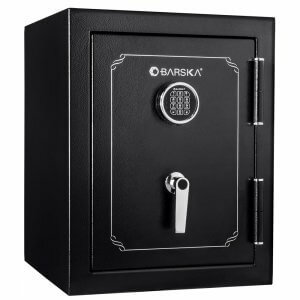 The Barska FV-500 (AX12674) Digital Keypad Safe provides 3.45 cubic feet of fireproof storage in a solid steel housing with fire retardant gypsum board for additional protection from flames. The FV-500 features 2 movable shelves that can be adjusted to the users liking, and are covered in a protective carpet to prevent scratching on the stored valuables. A 3-point solid steel locking deadbolt system and pry-resistant door help secure the contents inside from theft and tampering.